Serve appetizers as dinner or at a party. When you're feeding a group of hungry kids, appetizers can be your best friends. Serving appetizers is often easier and more affordable than serving a sit-down meal, and these treats are often easy to assemble ahead of time. Appetizers will also appeal to adults, so they're ideal if you're feeding a crowd of parents and kids. Fill each one with protein and fresh produce to satisfy your entire group. Dressing up vegetables makes them instantly more appealing to children, and serving them first ensures that hungry children will go right for them. In order to make vegetable dishes that are easy to eat without utensils, use vegetables as the base of each appetizer. Cut off the tops of cherry tomatoes, scoop out the seeds and pipe in a mixture of light cream cheese and pesto or dry seasoning mix. To make a healthier version of spinach-artichoke dip that both children and adults will like, cook spinach with onions. Add ranch seasoning mix and some low-fat or fat-free sour cream. Stuff artichoke hearts with the mixture. Sprinkle a bit of shaved Parmesan on top. Once children have snacked on vegetables, they'll likely be craving something a bit heavier. Make healthy meat and seafood dishes that will appeal to everyone by dressing the protein up with bright flavors instead of frying them or dipping them in fatty sauces. Marinate chunks of skinless chicken or tuna in lemon juice, olive oil and rosemary and refrigerate them overnight. Or add some extra flavor to the marinade with a dry salad dressing mix. When you're ready to eat, push the pieces onto skewers and grill or bake them until the meat is cooked through. 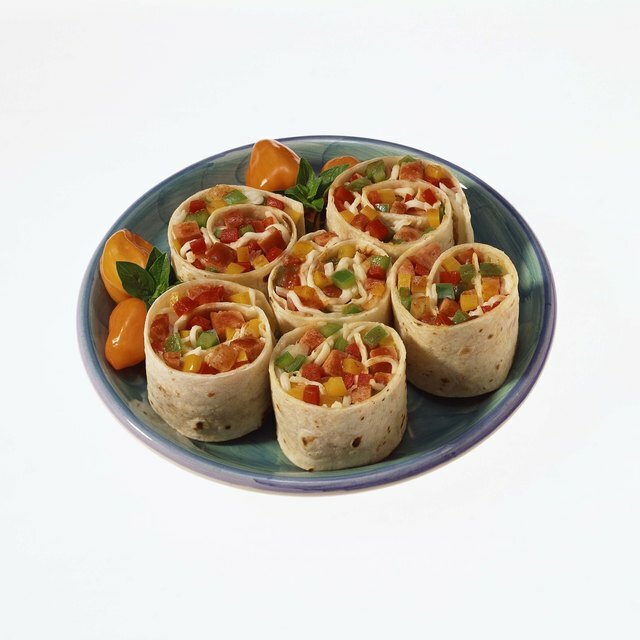 Provide an assortment of dipping sauces to encourage the kids to eat these protein-filled appetizers. Try honey mustard, barbecue sauce and creamy dressing for kid-friendly dips. Nuts are full of protein, and both kids and adults will love scooping up handfuls of them. Although nuts contain healthy fats, eating too many can be unhealthy, so mix them up with lighter ingredients such as corn and rice cereal, low-sodium pretzels and unsalted popcorn. Dust the entire mixture with some cayenne pepper and cumin to make it taste smoky, add a bit of brown sugar and cinnamon for kids who love sweets, or use a ranch seasoning mix for a savory delight. Make these nut mixtures up to a week ahead of time and store them in airtight plastic containers to keep them crunchy. Miniature tarts are fancy enough for adults to enjoy, while children will love them because they look like pizza or pie. Roll out sheets of phyllo dough or roll whole wheat bread dough into a thin layer. To make savory tarts, spread on a bit of pesto or herbed cream cheese and top the dough with grilled eggplant, mushrooms and peppers. You can easily make your own flavored cream cheese by mixing a packet of dry salad dressing with a container of cream cheese. For sweet tarts, sprinkle the dough with brown sugar and cinnamon and top it with sliced apples and pears. Bake the tarts until the dough is cooked and slice them into bite-sized pieces. Once you've assembled the tarts, you can refrigerate them overnight and stick them in the oven just before mealtime. What Dessert Can I Make With Leftover Pizza Dough?